The inaugural IMPRESS Trust in Journalism Conference 2018 took place in central London on Tuesday 6 November, attended by a diverse audience of over 100 news publishers, freelance journalists, academics, students and media policy experts. 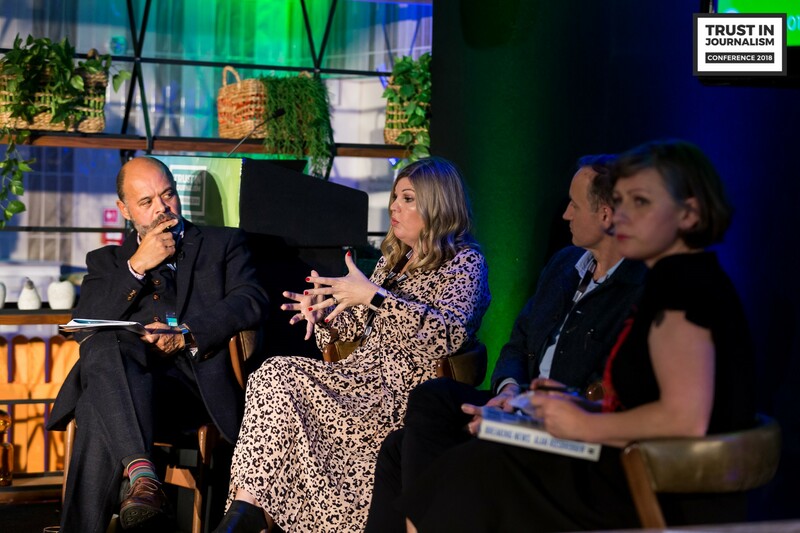 The programme covered issues that ranged from high-quality journalism and partisanship, to the relationship of publishers with digital platforms, and the latest innovations and creative business models in the independent news sector. The list of speakers included a variety of media experts, including journalists, editors, academics with vast experience in the news sector. “We have listened to our members and today’s programme is designed to address the most pressing questions for them. How can you produce journalism that is both engaged and authoritative? How can we rebuild the relationship between independent publishers and social media platforms? And what are the editorial and commercial innovations that are driving the independent sector?”. Readers expect the public interest to be served by journalism. [At the Guardian] the task was to build an economic model to support it”. 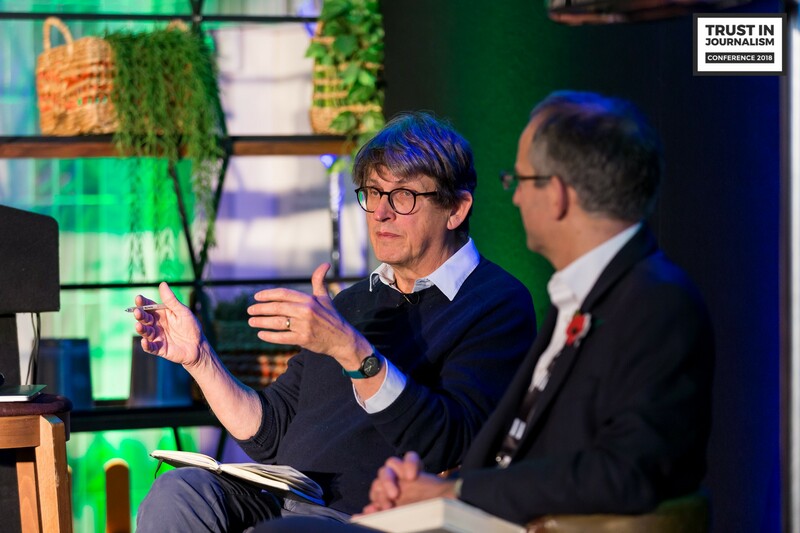 Asked about diversity in the newsroom, Rusbridger asserted that more diverse newsrooms “will be better news organizations; they will produce better journalism”. The first panel of the day was chaired by Mary Fitzgerald, Editor-in-Chief of openDemocracy, and addressed the question ‘Can journalism be partisan and high-quality?”. Gavin Esler, author, journalist and former BBC correspondent, pointed out that the challenge was that “You cannot balance someone who lies with someone telling the truth”. In relation to trust, he added: “[In today’s landscape], if you can be a trusted guide through this deluge of misinformation, that is gold. We’ve lost trust in hierarchies…the totalitarian mindset is when people can’t distinguish between truth and falsehood”. In reply to the panel question, Vanessa Baird, Co-editor of New Internationalist, said: “I think you can do it. You don’t let your opinions influence you when you come up against the facts and speak truth to power. Part of that truth is recognizing our own biases. The journalistic convention is to go for the killer fact. It would be more respectful to our readership to show the range of facts”. Chris Elliott, Director of the Ethical Journalism Network, “Newspapers have been partisan for 200 years (…) We should stop obsessing about what is a journalist and focus on what is journalism”. The second panel of the day was around the relationship between publishers, platforms and media policy: ‘Can’t they all just be friends?’. Journalist and professor Kurt Barling chaired this session. Damian Tambini, Media Associate Professor at LSE, set the scene: “It isn't true that the government can't do anything about platforms. Competition, liability, responsibility: all things that can be pursued, not without problems like with freedom of expression, of course”. He also mentioned that when it comes the relationship with platforms, the priority at this stage should be to open productive channels of communication with the platforms. 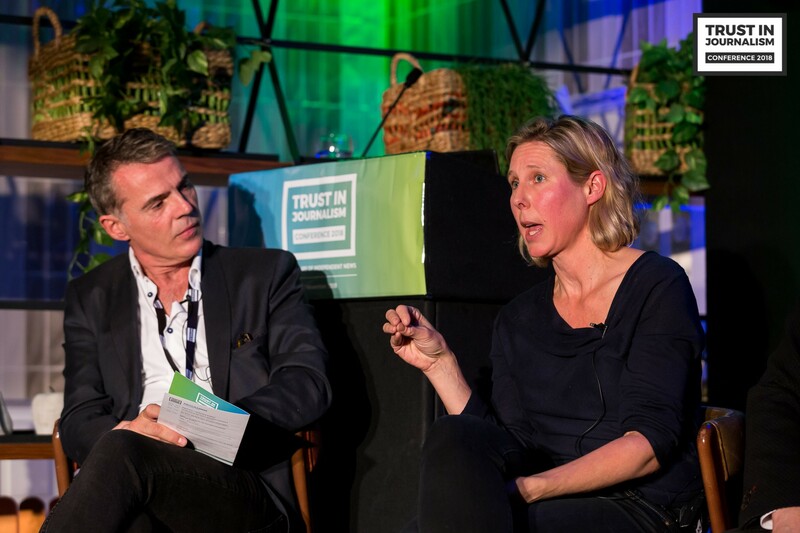 Rachel Coldicutt, CEO of think tank Doteveryone, which recently presented a green paper with a proposal to regulate platforms, referred to the goals of Doteveryone: “our vision is that the regulators that exist need more skills and capability to regulate platforms. We need to create an evidence-based, impartial organisation. And look into the possibility of an ombudsman”. About the general landscape of platforms and information, she said: “It's not just about the information wars. There are injustices, how technology is changing everyone's working lives, for example (…) What I'm interested in ultimately is a functioning democracy”. Emma Meese, Manager of the Center for Community Journalism (C4CJ), referred to the recent grant they got from Google News Initiative to fund a network or agency for hyperlocal news organisation to monetise their news production in a fairer way. 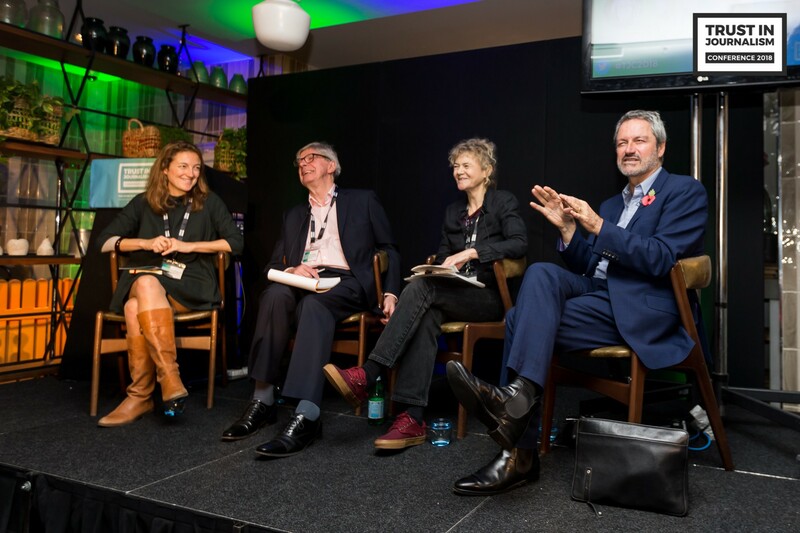 Director of Byline Peter Jukes chaired the panel on innovation in the independent news sector. Daniel Ionescu, Editor of The Lincolnite, spoke about focusing on organic growth on social media, particularly facebook, as a key to their success: "How did we get to half a million readers? We try to be there for the people, where news is happening (…) We tried to become a sustainable digital newsroom". Alistair Tibbitt, co-founding board member of The Ferret spoke about being a membership based news organisation and their connection to main stream media: "We see ourselves as partners of the MSM”; ". All our subscribers become reader members automatically. As a membership organisation, we also have an ethical advertising policy, for example, supported by our members". Sarah Cheverton (Editor-in-chief of Star & Crescent) described their citizen journalism model: "We don't take advertising on the website. (…) When we started, we were really frustrated by the state of local news. We knew there were a lot of opposition voices locally. So our aim was to plug in gaps. We got funding on the basis of what we were doing on the ground. We too see ourselves as complimentary to MSM"
Rachel Oldroyd, Managing Editor of The Bureau of Investigative Journalism, spoke about the Bureau Local project, funded by the Google Digital News Initiative. She spoke about the importance of local journalism and the collaboration with both local and national partners as crucial to the project as the heart of the model. About data journalism is a key part of the project, she said: "Data journalism was all about national news. But in a way that is meaningless, that doesn't affect people's lives. The only way you can understand what's going on is as part of local communities"
Meera Selva, Director of the Journalism Fellowship at the Reuters Institute for the Study of Journalism, complemented the discussion with examples of journalism projects around the world. She said she saw three trends in journalism globally: slowing down (in-depth, investigative journalism), journalism as a kind of resistance, and collaborative journalism. When asked about whether the British media was lagging behind in this context, she said: "No, but it has to protect what it's got. The press is still part of the fabric of the country, broad band is largely available... But trust is something that has eroded very fast". The programme was complemented with a practical workshop on data visualisation and storytelling. Daan Louter, Head of Newsrooms and Design of Flourish, provided a demonstration of Flourish as a tool for newsrooms to bring data to life in engaging ways. Their newsrooms plan is free to use by newsrooms thanks to a partnership with Google News Labs. The inaugural Trust in Journalism Conference was attende by 100+ delegates will be attending the event including: thought leaders and innovators from across the media industry, 25+ independent news organisations, and delegates from news, legal, regulation, civil society, politics and academia. On the day, IMPRESS also published its Annual Report 2017-18 which shows: a 123% increase in the number of regulated publishers, an extended arbitration scheme, a wide geographical coverage in the UK, and an important increase in its regulatory activity. Gavin Esler: "We should hear a vast range of voices. But you cannot balance someone who is lying with someone who is telling the truth"